A suspect has been arrested by police in the Jalthara area for allegedly printing counterfeit currency notes. 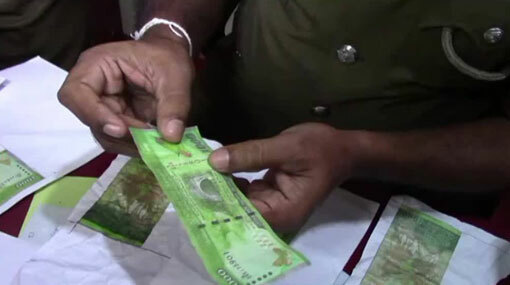 Police said that the suspect in question had printed the fake notes at his own home and that he was apprehended based on information received by police regarding an individual who has been purchasing goods with counterfeit money from shops in the vicinity of Welipillewa, Jalthara. The suspect was arrested with 8 fake notes of the Rs 1,000 denomination following a vehicle search carried out based on information that the individual in question arrives on a motorcycle. During interrogation, the 42-year-old man had confessed that he had printed the counterfeit currency using a small printer at his house in Hokandara North. Police officers searched his home and seized 48 fake notes of the Rs 1,000 denomination, a printer and other equipment used by the suspect to carry out the crime. He is to be produced at the Kaduwela Magistrate’s Court today (19).